Meaning “help” in Swahili, the mobile “saada” application aims to improve the efficacy and efficiency of community health volunteers screening patients for cervical cancer in Kisumu, Kenya. This project is the extension of a previous project for the Duke class CS408: Delivering Software to Client, which pairs student developers and designers with a client team to build a specialized application. The mSaada developer team is composed of four Duke seniors: Our designer, Rachel Settle is a Computer Science major, Visual Media Studies minor, and pursuing the Information Science certificate. Working on the user experience is Carly Levi, a senior studying Computer Science and Global Health who is particularly interested in women’s and reproductive health and hopes to use her background in technology to come up with effective interventions around the world. Focusing on the back-end database design is Catie Grasse, a senior majoring in Computer Science and minoring in Visual Media Studies. Also working on the back-end design is Philip Kariuki, a senior from Kenya studying Computer Science and Philosophy. This collaboration began last Fall and should be ready for field testing by this Summer. 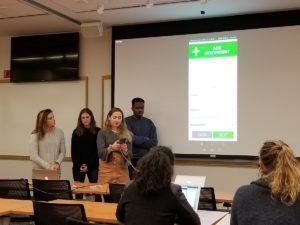 This past semester was focused on building the application from the ground up: making design and style choices for the app, building a database with Google technologies, and collaborating with Dr. Meghan Huchko and her team to decide what features and functionalities are most important to the application. The current application is composed of four main features that combine the goal of improving patient screening with creating quick accessibility to educational materials for cervical cancer screening. For the goal of improving patient screening, the app allows the user to create or edit a patient’s record and walks them through a comprehensive survey to fill out patient information. Once a patient has been added, they can also be searched through the app to reference their existing survey answers. To improve access to educational content, the app also has an FAQ page for community health volunteers to refer to regarding commonly asked questions about cervical cancer screening, as well as an illustrated walk-through for a sample patient-CHV interactions. Looking ahead, the next steps of the project are to user test with community health volunteers in Kisumu. This testing feedback loop is critical to the user experience and design of the app, as it will be used to iterate on the existing design, creating an application that is genuinely useful for community health volunteers in their work to screen women for cervical cancer.